Paying for items under €30 in shops can now be done by swiping your mobile phone against a contactless terminal. Google is launching Android Pay in Ireland today, meaning those with Samsung, Sony and other Android phones can now pay for items in stores by swiping their phones. The system will work anywhere that accepts Mastercard or Visa contactless debit and credit cards issued by AIB or KBC. This includes convenience stores such as Spar, Mace and Londis, food chains such as McDonald's and KFC and other major retail chains such as Tesco, Boots and Eason. Over half of phones sold in Ireland are Android phones. Android Pay will work with most Android phones sold here in the last three years. But the phones must have a near-field communication (NFC) chip and use a relatively recent version of Android ('KitKat' 4.4 or newer). The system is not compatible with iPhones. There will be no additional charge to using the phone as a payment method. However, standing charges associated with the accounts will apply. As with other forms of contactless payments, there is a €30 limit on transactions and a cap of five transactions per day. Bigger individual transactions are accepted at some retailers. 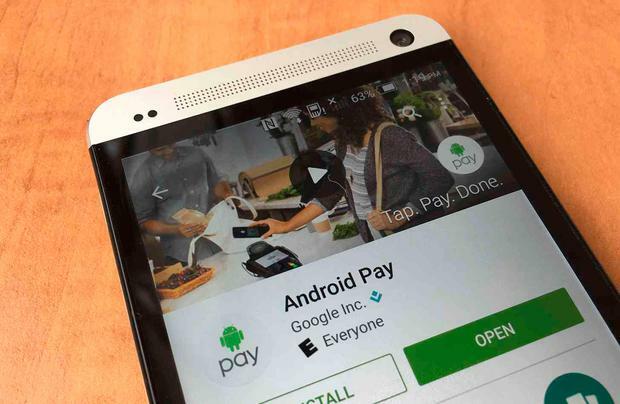 The move makes Android Pay the first phone payment system in Ireland. Apple was thought to be preparing the introduction of Apple Pay into the Irish market by the start of 2017, but this now looks unlikely. Samsung Pay has also been delayed, with a 2017 date now likely for the UK market and no confirmation of an Irish launch. The move comes as use of contactless cards continues to grow in Ireland. Visa, which is the largest contactless card company here, says users of its contactless cards complete over a million transactions per week using the system. It says that the average Irish purchase value made with a Visa Debit contactless card is €8.09 and falling, indicating greater use for more casual purchases in convenience shops. Irish people using Android Pay can also use the system when travelling in the US, UK, Poland, New Zealand and Hong Kong.